Recently our photo club participated in Help-Portrait Day. If you are unfamiliar with Help-Portrait you really need to check it out. Go to there website @ Help-portrait.com. When I started our club at our church one of our goals was to give back to our community. I was sharing my idea with a local photographer who said - you have to check out help-portrait. So I did. We were not able to do our shoot on the day when everyone else was doing it - the organization could only make it happen on a Monday night. SO that is when we went. Basically Help-Portrait encourages photographers to use their gifts and talents to make great portraits for people who might not be able to afford to get one done - or who can't get out to have a picture taken. We worked with a great organization here in Omaha called - Restored Hope. They are helping women and their families here in our city. This picture is of Brooke. 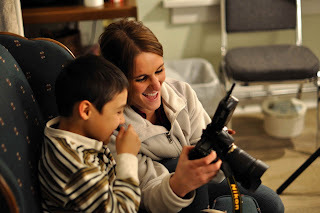 She is a great photographer - she is showing one the young guys his picture. He was an awesome young man. Ton of personality. He loved getting his picture taken. Anyway - I was there just to help. I stayed out of the way mostly. It was super fun.